Sweet and Sensational Coconut Kisses Cookies! 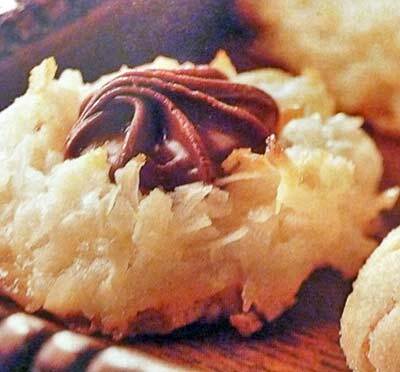 If you love chocolate as much as you love coconut macaroons, these homemade Coconut Kisses may quickly become your new favorite cookie. 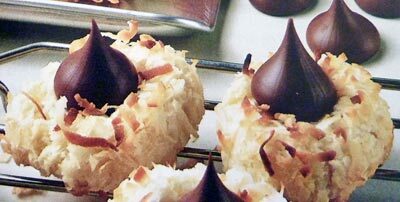 Like the more traditional Peanut Butter Blossom Cookies, these recipes create easy-to-make coconut macaroons that you then dress up with a Hershey's chocolate kiss. We believe that coconut and chocolate is a close rival to peanut butter and chocolate in the taste and flavor department. Our first recipe has only five ingredients, so these cookies are a snap to make! The second recipe has a few more ingredients and it too creates a delicately moist coconut cookie. The best part is they can easily be customized by the type of chocolate kiss you use to decorate them. Preheat the oven to 325F degrees. Line cookie sheets with parchment paper or silicone liners. In a large bowl, combine the sweetened condensed milk, vanilla and almond extracts. Drop the batter by rounded teaspoonfuls onto prepared cookie sheets and slightly flatten each mound. Bake for 15 to 17 minutes, or until golden. Remove from the oven and immediately press unwrapped Hershey's Kiss candy into center of each cookie. Transfer cookies to wire rack to cool completely. This recipe yields 4 dozen Coconut Kisses Cookies. In a large bowl, cream together butter, cream cheese and sugar until light and fluffy. Add egg yolk, almond extract and orange juice and beat well. Gradually add dry flour mixture to creamed mixture until thoroughly combined. Stir in 3 cups of coconut. Cover tightly and chill 1 hour or until firm enough to handle. Shape dough into 1-inch balls and roll in remaining coconut. Place coconut balls onto parchment-lined or ungreased cookie sheets. Remove from the oven and immediately press unwrapped chocolate Kiss candy into center of each cookie. Allow cookies to sit on sheet for 1 minute before transferring to wire rack to cool completely. This recipe yields 4 1/2 dozen Coconut Macaroon Kiss Cookies.